One of my first forays into cooking was for my school's international dinner night. I was in French class and within the first few weeks of class, I became obsessed with French culture. I thought the language and the art was (and still is) beautiful but the food, oh the food. There's nothing quite like a meal of French food shared around a table of friends and family (plus any given day I'd gladly take a croissant and coffee for breakfast). And so, these crepes are a bit of an updated nod to bringing French culture home. 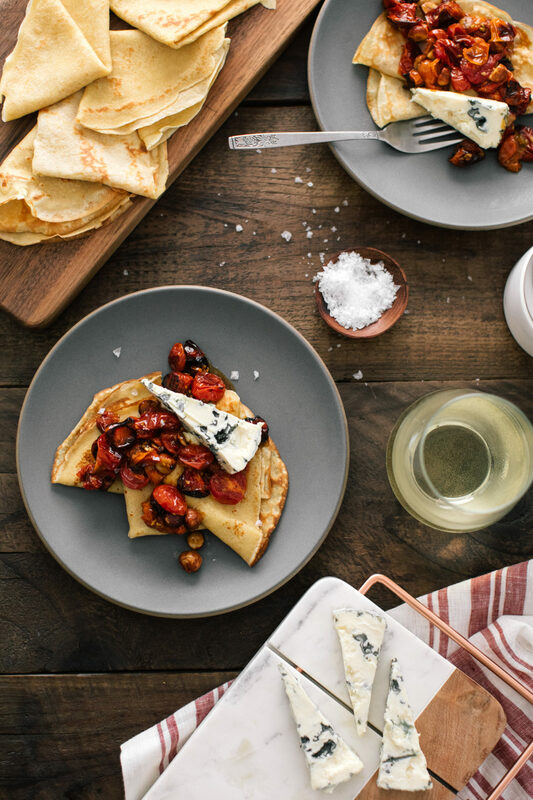 We eat savory crepes quite often and the roasted tomatoes tossed with a hazelnut-butter dressing might be my favorite summer treat. When served warm, the St. Agur blue cheese melts a bit into the tomatoes and it's so rich and delicious. What really brings this meal home is the Trimbach Pinot Blanc. The wine helps balance the richness of all that wonderful President butter and St. Agur blue cheese. Best of all, you can make an extra large batch of the crepes to use throughout the month (they freeze amazingly well). Have these beautiful savory crepes for dinner then have a breakfast crepe or dessert crepe the following week. Or, if you're like me and have a child- a bit of nut butter and honey spread instead a crepe makes for the perfect snack! The post Crepes with Tomatoes and Butter Hazelnuts appeared first on Naturally Ella.